Above: Jay Heikes, Niet Voor Kinderen, 2015, individual monoprints. Highpoint is honored to present an exhibition of prints from Highpoint Editions’ collaboration with visiting artist Jay Heikes. During the course of Heikes’ project with Highpoint, he explored the idea of the exquisite corpse — a surrealist parlor game — through cyanotype, lithography, and screenprinting. His explorations in printmaking led him from lithography to screenprinting and working by hand with asphaltum, a medium typically applied as a protective coating on etching plates. The resulting prints typify Heikes’ interest in pushing the physical and evocative properties of materials, using them in new and visually powerful ways. Niet Voor Kinderen: New Prints by Jay Heikes will be presented in Highpoint’s main galleries, and will be on view October 30–November 21, 2015, with an opening reception on October 30. The exhibition will feature nine monoprints, a lithographic print portfolio, a series of drawings, and work in other media by the artist as well. 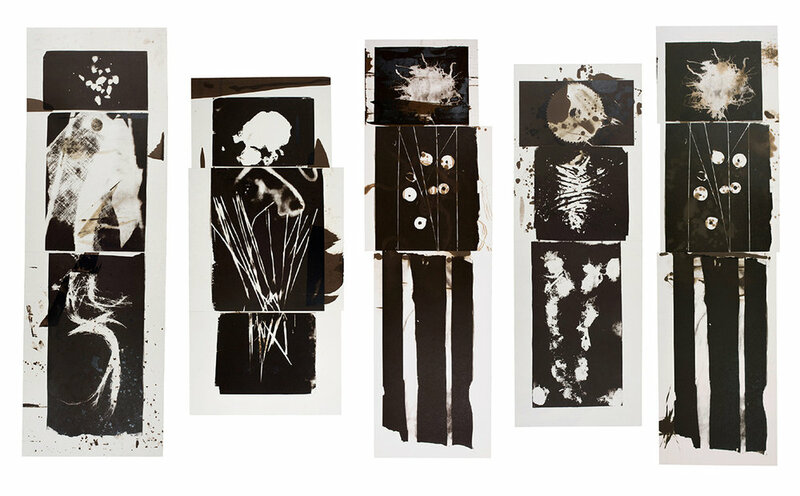 At various moments throughout his career, Heikes has celebrated both the physical and mystical properties of his materials in an exploration of what might be considered alchemical processes more akin to the natural world than the art world. He has talked about finding a space in his work that is “just beyond corrosion, one of complete alienation between human and material where there are things to be discovered but also the possibility of destruction.” At Highpoint, his elemental investigations led him to asphaltum, a tar-like substance commonly applied to etching plates to protect them from unwanted scratches on the printing surface. Heikes proposed using this non-archival, decidedly untidy, and slightly noxious material in an unorthodox way – as ink -resulting in prints of extraordinary inventiveness and visceral power. Born in Princeton, New Jersey, Heikes lives and works in Minneapolis, MN. He holds a BFA from University of Michigan (Ann Arbor), and an MFA from Yale University, and his work has been exhibited at Walker Art Center, The Whitney Museum of American Art, and the Institute of Contemporary Art (Boston), among others.